It's a novel predicting a grim future where climate change and internal conflicts have caused tremendous damage. North and South are divided, not by the racial lines, but by the usage of fossil fuel, so severe the division is that a second Civil War starts in 2075 and ending in 2095, costing millions of people their lives in the process. Omar El Akkad's American War is written well, has good characters development, plot and fast moving story, and I felt while reading it that the writer has written this novel as a metaphor, pointing to the eerie similarities between our contemporary world in early 21st century with the mere six to eight decades in the future. I thought it would be a very different sort of book, like adrenaline pulsing adventure story. The Lost City of the Monkey God - A True Story by Douglas Preston turned out to have more nuanced actions but more thoughtful observations about the archaeological exploration, Honduran politics, academic squabbling and the terrible parasite based disease called Lieshmaniasis, a disease that the millions of people in bottom rung of the economic ladder have to face without generating much interests from the big pharmaceutical companies as less money to be made from researching and developing vaccines and other medicines combating this "poor" world disease. In November I finished reading two books. First was Benjamin Percy's The Dark Net and the second one was Blake Crouch's Dark Matter. Both of them are thrillers, well paced, good story plots. The Dark Net felt like a science fiction in the beginning but it turned out to be a super natural story. Not bad as a page turner, but I think the author Benjamin Percy has much more potential than he displayed in The Dark Net. He pointed some of the darkest corners of the web and how it can spirals out of bound, ushering in the dark ages of future. Plausible. Dark Matter by Blake Crouch has a good story plot, that unfolds fast and furious. The quantum mechanics based theme, the Schrodinger Cat theory, alive and dead at the same time, the multiverse, the intense longing to return to the loved ones made the reading memorable. Terry Hayes' I am Pilgrim is probably one of the best spy thriller books I've read in recent days. More than 800 pages long but packed with heart pounding actions, deep character development along with the writer's observations of socioeconomic malice abundant in many parts of the world. The protagonist and the main villain, both of them brilliant and determined in their own cause, and the various events that led to the final climax was breathtaking. This was a page turner and the writer Terry Hayes is prolific in his words, describing scenes in detail as if I was watching a movie. It proves the brilliance of the writer's screenwriting ability that he transformed into this unputdownable book. Where are all the childhood friends? "Do what you are passionate about. Without passion, your work is not your love and you can never be your best or be better than others who are running with their passion. ""Do something that you are inherently good or talented at. We all have our relative talents but spending your life doing something that is inherently more difficult puts you at a disadvantage to other more talented people. ""Do something that creates value and can be sold into a market present or future. Creating a widget that nobody but you wants may be self satisfying, but it certainly is not going to make you your fortune nor lead you to personal or professional success. "Here is another quote: "It’s simply a determination to never ever give up. That is the most important element of success: dogged determination. " They are uprooted from their burnt out villages. Their schools are demolished. Homes are ransacked and bombarded. Malnourished children fleeing with persecuted parents. 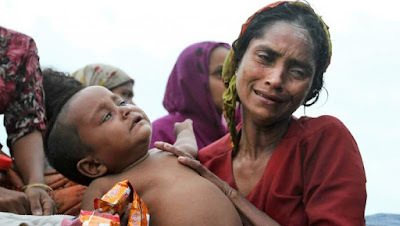 The faces of traumatised Rohingyas, begging, pleading for help. Thousands of them drowned in sea while attempting to flee by boat and many more died in jungle camps, many of these are run by brutal people smugglers. And when the news of ethnic cleansing started pouring out of Myanmar, the Nobel laureate Aung San Suu Kyi's response was shocking as she takes the trumpeted "fake news" to brush aside the concern. At first, I didn't want to read this book despite its winning the Pulitzer Prize, National Book Award along with other distinguished accomplishments. Having read a few of the great books earlier that described the horrors of slavery, its aftermath, even the continuation of its thread in various forms into 20th and 21st century, I thought it would be a tale of endless brutality and human deprivation that I can pass for now. After reading Colson Whitehead's "The Underground Railroad", my initial assessment of grimness was justified but in the end I was glad that I had read this great novel. Two Books - Fiction and Non Fiction - Wait...What? Two books I have read recently. One is Graeme Macrae Burnet's novel "His Bloody Project: Documents Relating to Roderick Macrae" and the second one is a non fiction written by James E. Ryan, title: "Wait...What? And Life's Other Essential Questions". I have enjoyed reading both of these well written books. The problem is not only the disgraceful Muslim ban, the shameful wall, the taking away of privacy protection from many immigrants and non immigrants. It is also the ingrained belief in many that this banning decree only applies to those people from hand picked nations. History has the abundance of similar scenarios when the most vulnerable segments of the world were barred from leaving the persecutions of despot rulers. Many of them perished, children, women, men, emaciated, degraded to the utmost bottom level of a concerted dehumanization process. Yesterday's Remembrance Day for the Holocaust victims is one of the painful reminders of our world's blunder of the past. Some in this world are indeed brave and full of compassion. The author of this remarkable non fiction book, Bryan Stevenson, is surely one of them. This is an impactful book that gives detail on the sordid state of criminal justice system in the US, world's one of the most advanced nations in terms of economy and societal progress. If US is in such a painful state where equal justice and protection for all citizens needs an urgent transformative overhaul, then what can be said about other nations where democracy and human rights are in unstable ground? In my humble opinion, this should be a must read book as I believe the real life pain and anguish of the innocent people who are denied the fair justice for so many years can help people who are unaware of this miserable justice system can help raise the awareness for the necessary correction in the system.